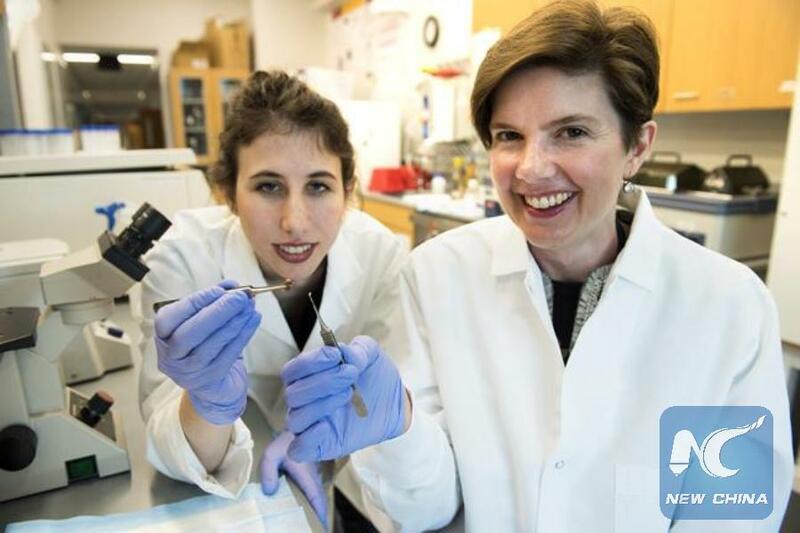 LOS ANGELES, April 15 (Xinhua) -- U.S. biomedical researchers have developed a new 3D-bioprinted patch that shows potential of helping heal scarred heart tissue after a heart attack. Heart disease is the number one cause of death in the United States, killing more than 360,000 people a year, according to the American Heart Association. The research is being hailed as a major step forward in treating patients with tissue damage after a heart attack. "This is a significant step forward in treating the No. 1 cause of death in the U.S.," Brenda Ogle, an associate professor of biomedical engineering at the University of Minnesota, said in a statement. "We feel that we could scale this up to repair hearts of larger animals and possibly even humans within the next several years." According to the new study published this week in the U.S. Circulation Research, a team of biomedical engineering researchers, led by the University of Minnesota, recent advances allowed researchers to use laser-based 3D-bioprinting techniques to incorporate stem cells derived from adult human heart cells on a matrix that began to grow and beat synchronously in a dish in the lab. The muscle like patch was then placed on a mouse heart following a simulated heart attack. Just four weeks later, researchers saw significant increase in functional capacity. Compared with previous research, researchers said the patch is modeled after a digital, three-dimensional scan of the structural proteins of native heart tissue. The digital model is made into a physical structure by 3D printing with proteins native to the heart and further integrating cardiac cell types derived from stem cells. Only with 3D printing of this type can researchers achieve one micron resolution needed to mimic structures of native heart tissue. Next, researchers will test a larger patch on a pig, which is similar in size of a human heart. Ogle hopes within a decade, the patch could reach clinical trials and be used in patients. The research was funded by the National Science Foundation, National Institutes of Health, University of Minnesota Lillehei Heart Institute, and University of Minnesota Institute for Engineering in Medicine.